GMOs in The United States are a controversial topic of interest; however, many farmers in Sub-Saharan Africa have switched over to GMO crops because the potential benefits are so strong. 1 African farmers have embraced the technology that has already proved itself to lower the cost of production while producing a greater yield. GMO seeds tend to cost a little more but they will not need as much tending over their lifespan. This is a great relief to small time African farmers who would normally have to worry about not only the cost of pesticides but the time needed to spray them. A farmer living in Sub-Saharan Africa has a lot to worry about. With the addition of GMO crops the farmer has a lot less tending to do in order to obtain more crop. With GMO crops the farmer can experience up to a 200% increase in yield, this means that the farmer can potentially sell more products and lower his/her prices so that customers can buy more products (Mcdivitt,2018). If prices are lowered more people, who were previously too poor, will have the ability to purchase the crops. If the farmer Is able to sell more crops and make more money they will be able to spend more money than they were usually, this is stimulating the economy. Farmers are also saving money of the crops over time. If the farmer has to spray pesticides on their crops 7-12 times during a growing season they are spending way more than necessary. A GMO crop tends to only need to be sprayed 2 times a growing season. This doesn’t seem like a big savings until you think of the size of these farms. If a farm is spraying 1000 plants over the course of a season and those plants need to be sprayed 8 times that is a lot of pesticide used. The pesticide sprayed is only in a fine mist but over the course of an entire field multiple gallons cold be used for each application. When spraying is cut down to a quarter of what it used to be it can translate into huge savings for the farmer. GMO crops do cost more for the initial purchase and some farmers are apprehensive about paying more for a crop they haven’t grown before. When these farmers see that the potential yield and operating costs are exponentially change they do tend to think twice. 1Bouscaren, D (2016, October 4) Will St. Louis-Grown GMOs Help East African Farmers Avoid Food Shortages? It’s Complicated. Illinois public media. Food Security: GMOs, Changing the Future of Farming. A big problem in Sub-Saharan Africa is food security. Over 60 million people in Sub-Saharan Africa are malnourished and are facing starvation 1. This is a result of the millions of acres of unused land in Sub-Saharan Africa. These acres go unused because the farmers don’t have resources to properly use them. These include better seeds, plants with higher yields, and fertilizers. Genetically modified organisms, or as most people know them GMOs, play a huge role in how the farming industry works today. Genetic modification is a process where genes from an outside source are implanted into another organism’s genes 2. They were first introduced into our food products in the 1990’s, and now are in a great majority of our food products. One of the biggest factors in farming is the yield of the crop. Because of the genes implanted into them, GMOs have been proven to have a higher average yield. The average yield of corn in the U.S. has increased by 37% since 1996 3. The average yield of soybeans has also gone up; increasing by 21% since 1994. Part of the reason that the yield of plants in Sub-Saharan Africa is low is because of the amount of nitrogen in the soil. It is so low that their yield is only 20-40% of the United States yield 4. In order to help this without having farmers spray so much nitrogen fertilizer that it hurts the environment, is to use nitrogen fixing plants. With the nitrogen fixing plants the ground will be better fit to grow the crops, resulting in the higher yield. Another major factor that affects how well their crops grow is the ineffective use of part of the land. Obviously this cannot be changed fully, but it can be helped with the use of GMOs. With new plants that have pesticides implanted into their genes, the amount of effort put into farming is decreased 5. Along with making their farming easier, GMOs with pesticides infused into them can make the crops healthier. A group of women sort through their harvested crops. Although food insecurity in Sub-Saharan africa is a huge problem, with the help of GMOs it could soon be on the decline. Once the commercialization of GMOs is popularized, the higher yield in crop will help. Along with decrease in labor needed to tend the crops. As well as the better economic state most of these small farmers could find themselves in. All of these factors show how GMOs would help with Sub-Saharan food insecurity. Posted on April 30, 2018 May 2, 2018 Author pkirwin1Categories Feeding a Diverse, Growing PopulationLeave a comment on Food Security: GMOs, Changing the Future of Farming. The world population is currently around 7.6 billion with Africa making up roughly 1.2 billion of the population. 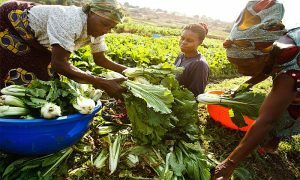 1 Food production is an ever-increasing challenge for the world especially in parts of the world like Africa where the nations aren’t as developed as others and they face harsh climates. Drought being one of the major problems that countries in Africa face. In order to face these challenges and feed their people African countries are increasingly using GMO’S to improve the chances of having successful harvests. Monsanto is an Agricultural Biotech company that is mainly known for their work with GMO’S. They have over 20,000 employees world-wide and have facilities in 69 countries. Monsanto is Headquartered in St. Louis, MO (Monsanto 2018). They are also a fortune 500 company. In short, they are a powerhouse of a company on a global scale. One of Monsanto’s most recognizable products is Roundup weed killer. They also sell seeds that are specially designed to be resistant to Roundup. They supply roughly 25% of all seeds worldwide. So, it makes sense that they’d be interested in improving their product for any climate depending on what challenges face it. For southern Africa one of the main challenges is drought. If their seeds are what works best then the farmers will obviously choose to use them instead of another company’s seeds, thus increasing Monsanto’s bottom line. So, to combat drought Monsanto decided to develop maize that would be better suited to the drought affected climates of southern Africa. 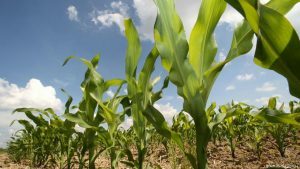 “Water Efficient Maize in Africa (WEMA) is led by the African Agricultural Technology Foundation (AATF), and funded by the Bill and Melinda Gates Foundation, the Howard G. Buffett Foundation and the United States Agency for International Development (USAID). Key WEMA partners include the National Agricultural Research Institutes in Kenya, Mozambique, South Africa, Tanzania and Uganda, the International Maize and Wheat Improvement Center (CIMMYT) and Monsanto.” 3 Monsanto was able to get a lot of support for their WEMA project from other large organizations that the farmers in these areas just wouldn’t of had access to on their own. When people talk about Africa, it’s not usually about their technology. People usually talk about the hunger issues, the harsh climate, no internet, and lack of education. But one country stands out from the rest, and that’s Kenya. Since the 1980s, about 80 percent of Kenya’s workforce comes from farming alone. Since being in Africa, Kenyans don’t have the technology like the rest of the world does. But, throughout the past few years, Kenyan technology is greatly impacting their agriculture and even their community. Local cow farmer looks for a pasture to feed his cows. 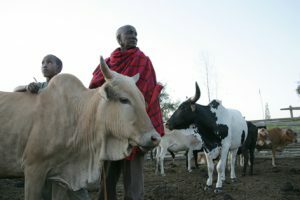 iCow started off with a simple premise: The creation of a gestation calendar would increase the productivity of the cows and, hence, food production and the wealth of individuals and communities.” With this technology, Kenyan communities can make more food and make more money for their families and communities. Father and son tend to their cattle. Raghavan also states that a well known money-transfer service, used by millions, is M-PESA.What this service allows for is farmers can pay for things, such as cows, food, or any other good straight through an SMS (Short Message Service). 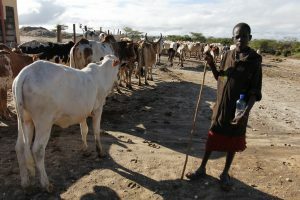 M-PESA is helping the community by making it easier to get money from the cow buyers and people who want to trade goods. “Mobile technology is improving the lives of some of Africa’s poorest people, in some of the continent’s most remote areas…fishermen are using text messages to set up markets along the shores of Lake Victoria and negotiate prices with buyers, which helps them sell more fish.” However, there are some downsides to the app. The app is only in English, so whoever has the app has to read and understand English, or use a translator which can make things more complicated. iCow isn’t just going to stay in Kenya; Kahumbu is hoping to expand the app into more countries in sub-Saharan Africa; these countries include Rwanda, Tanzania, and Uganda. Not only is technology improving the lives of communities and making them wealthier, it is also bringing them closer as a community itself. iCow has helped over 45,000 people that handle cows and has made some communities, families, and people much wealthier, If iCow were to spread to all of Africa, it could really help their economy flourish. Also, if iCow has helped people with their cattle, people could and should develop apps for other goods. Sub Saharan Africa is growing at an incredible rate. Predicted to reach 2.4 billion people by 2050. According to Bager, 1 the population will keep growing till 2080 where other high populated regions will start to shift and start to slow down on their growth rate. How will the production of food be equivalent to the growth of the population? Genetically Modified Organisms can help by having the farmers adopt more to using the GM crop. GM crops are where you go into its DNA. As it’s altered to help the crop grow better and produce more of yields. Which means more successful growth. According to Hansan, 2008 “Soil quality is poor in many areas, droughts are frequent, and infrastructure for transporting goods to market is limited.” The GM crop could help solve all these problems. GM will feed the future of Africa as GM crops get more advanced as the climate changes it will allow the food to keep growing no matter what. Africa spends an average of 35 billion dollars every year on food products developed in other countries. According Barbiere, 2015 All this money could be used to go into the agriculture and farmers to produce more so, the country does not have to depend on other countries. It GM will help feed the future generation that is set to keep growing, as the population is predicted to grow. The spending will double,causing Africa not to afford the food products they depend on from other countries. They could put the money into their system and make their food production more successful. Finding new invading ways to produce more yields. This is were GM crop would play a big role. All the money could go towards farming and altering seeds to survive and grow all over Africa. As a result, the research could find ways to fight off parasites and fight off the environmental problems. If farmers adopt the GM crop they will start to save money. “Pesticides are substances used to repel, kill, or control animals (insecticides) or plants (herbicides) that are pests.” (Hsiao,2015) The purpose is for the crop to grow without being damaged or infected with the pesticides. However, the use of herbicides and pesticides are a big controversial factor in the GM product. Why not produce a crop that you only must spray pesticides 10 to 15 times inside of spraying it 30 to 40 times, saving labor work and money. Having the seed modified to the specific parasite will save money and have more successful production. This would help the farmer out, by not having to pay workers as much because he would need little help when using the GM seed, allowing the farmer to spend more on producing more yields and buying better equipment when harvesting time comes, creating the perfect seed for the environment. This would make it easier for the farmer to produce more yields,creating a seed where a past drought does not hurt or prevent the seed from growing. The farmers will no longer need to spend as much money on these sources. 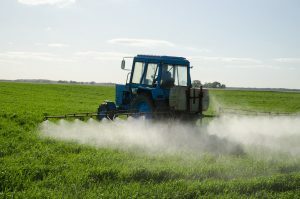 A farmer spraying the crops with pesticides. With there being 46 countries in Sub Saharan Africa, the challenges faced with the environment varies from country to country. Having little or no water can impact farming in a very negative ways. As more than 90% of agriculture in Sub-Saharan Africa is rainfed, increasing water-storage capacity, such as small tanks, ponds and reservoirs can help farmers adapt to variability in water supply and increase production (Bager,2014). With each country having a different environment for farming this, is a huge issue that the GM seed would help. For an example the vegetables and fruits grown in Michigan are not the same ones grown in Florida or California. Having GM seed modified to survive different environments will be a huge impact in Sub Saharan Africa. Finding the perfect seed for the region will help farmers be most successful when it comes to growing their products. Producing seeds for all type of conditions will help Africa because they face so much diversity in having different environments all across the 46 countries from having super dry regions to regions that receive more rain than others. The more farming land they can use will help. Jones and Thornton, (2008) found that under a range of scenarios to 2050, 35 million farmers across 3% of the continent’s land area will need to switch from mixed crop-livestock systems to livestock only, Losing all this land because of the environment changes that Africa is going through. This picture shows the crops being grown in the different regions and also describes the environment. For example there is already a crop that is attacking all the problems that come in the diversity of agricultural farming in Africa. 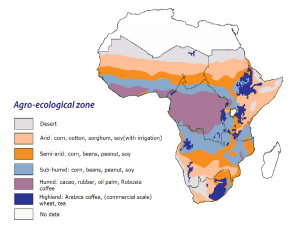 The Water Efficient Maize for Africa (WEMA). 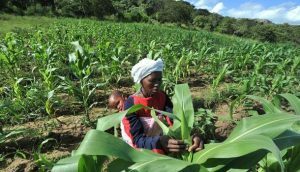 Maize is the most widely grown staple crop in Africa – more than 300 million Africans depend on it as their main food source – and it is severely affected by frequent drought. (Water Efficient,2012) Drought leads to crop failure, hunger, and poverty. This Modified crop was altered to sustain the drought environments being faced all across Africa. Also the crop fights against all the nasty pesticides that are a problem. With this seed being successful is could lead to the trust of believing in the GM crop saving Africa,allowing the crop to produce more yields in tough conditions. This is one crop that is already being put to use. As I stated the population of Africa is set to reach 2.4 billion by 2050. With the population growing more Modified seeds like (WEMA) could be a huge impact on producing food for the growing population.